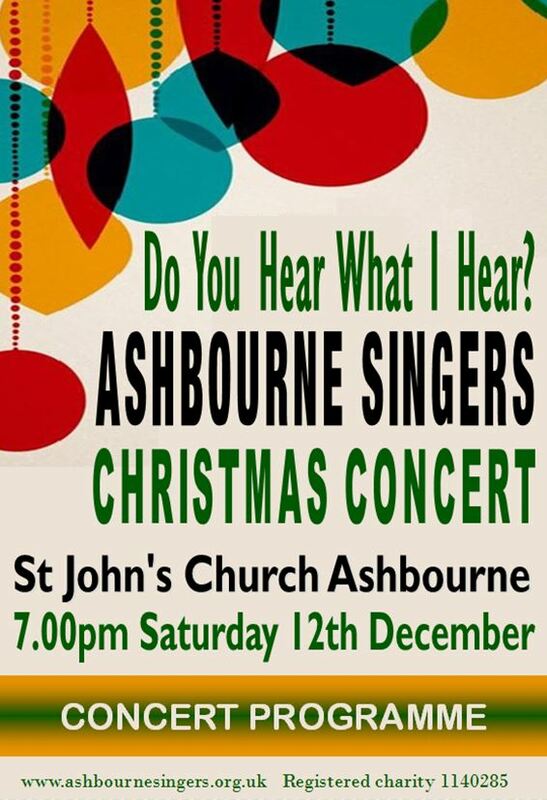 Ashbourne Singers delivered a varied and innovative programme of seasonal music to the delight of a packed audience in St John’s Church on the 12th December. The church was warm and welcoming. Choir members decorated the pew ends with festive fronds and the air hung heavy with the smell of mulled wine and mince pies. The opening number which was performed by candlelight (torches) set the mood for the first half. Along with old favourites the choir performed modern arrangements of traditional carols by Bob Chilcott, two beautiful John Rutter pieces (What Sweeter Music and Candlelight Carol) and Will Todd’s My Lord Has Come. Young Ashbourne Singers added sparkle to the whole event performing as only young people can, reminding us all that Christmas can still be magical. Sectional pieces from the choir included an amusing version of Oh Tanenbaum; a swinging Fly Me to the Moon and the men sang a Victor Johnson arrangement of Stars I Shall Find. John William’s Somewhere in My Memory from “Home Alone” with the children singing and Jocelyn’s tinkling Glockenspiel rounded off the evening making everyone feel that Christmas is really here. Josh Short accompanies our youth choir. He is in year 10 at QEGS and has been playing piano for 8 years and trumpet for the last 4 years. Josh’s particular interest lies with Jazz music. He attends the Royal Northern College of Music where he is studying Jazz Piano, Trumpet and Composition. Sophie Freeman accompanies our adult choir. Sophie is an accomplished saxophone & flute player. During the day she teaches at Foremarke, Repton & Abbotsholme School. In the evening she can be found on tour performing with many different musicians ranging from Marc Almond & Right Said Fred to Il Divo and Jack Jones. Sophie also travels the world as an examiner for Trinity College London. Michael Halls is Director of Music at St Oswald’s Church, Ashbourne. Before that he held a similar position at St. Matthew’s Church in Darley Abbey. He was Head Teacher at Turnditch C. E. (Aided) Primary School for 28 years. He is well known for promoting a love of music, especially singing, throughout the Ashbourne area. Steven Duckworth has been the Musical Director of the Ashbourne Singers since September 2014, having taken over the role from the choir’s founder Linda Perry-Smith. 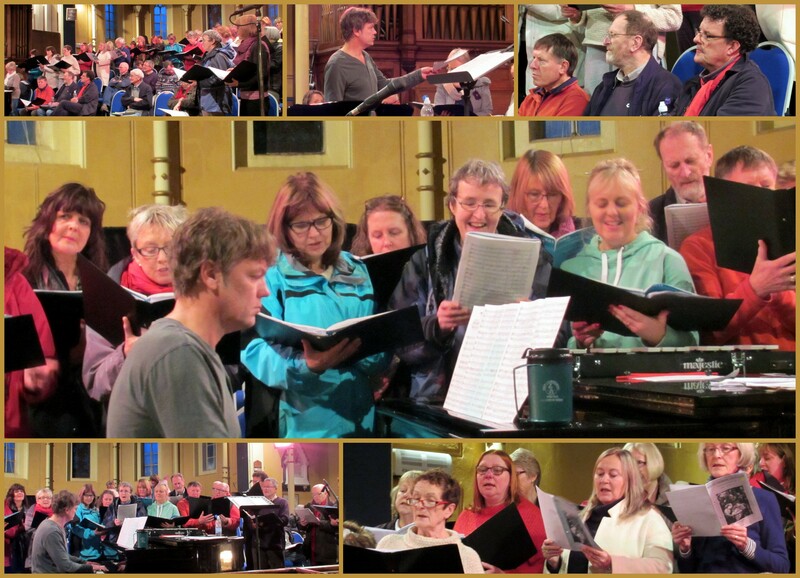 He has been involved with the choir since its formation in 2007 as pianist and assistant musical director. After graduating from Surrey University in 1993 with a degree in Music and Sound Recording, he has worked full time as a composer and sound designer in the video games industry, working on many high profile games and movie licences. “All Praise to Thee, My God, This Night” is a piece from the renaissance period, with text by Thomas Ken, (published 1674) set to a tune by Thomas Tallis, (ca. 1567). Popularly referred to as ‘Tallis’s Canon’, the melody is probably his most well known work. A canon is a melody that can ‘simply’ be started at regular intervals to create an evolving harmony with itself as the parts enter, eg. London’s Burning. It is a unique form and not at all ‘simple’ to compose. We sing verse 4 in canon. Although most often recognised as a Christmas hit, “Do You Hear What I Hear” was in fact written as a plea for peace in response to the Cuban Missile Crisis (Oct 1962). Originally recorded and released by the Harry Simeone Chorale around Thanksgiving 1962, it has gone on to be recorded by a huge list of celebrity artists, such as Bing Crosby, Whitney Houston and The Carpenters to name a few. “Rise Up Shepherd and Follow” is an African-American Christmas Spiritual (here arranged in a Gospel style) about a shepherd being encouraged to follow the star over Bethlehem to find the baby Jesus. “O Little Town” is an adaptation of the carol O Little Town of Bethlehem, where Chilcott intertwines a new melody of his own, with that of the traditional melody; a favourite technique of his. “Silent Night” is a carol of German origin (Stille Nacht). Sensitively arranged by Chilcott and with no over complication, he has simply re-harmonised the melody in his style and added a descant of his own. Originally known as ‘Carol of the Drum’, “The Little Drummer Boy” was written by American classical composer and teacher, Katherine K. Davis in 1941. The lyrics tell of a poor boy, who is summoned to the nativity where, without anything to give the infant Jesus, he offers the only gift he has… the gift of music. “What Sweeter Music” was written for Stephen Cleobury (musical director of) and the choir of King’s College, Cambridge. Nicknamed the ‘Carol King’, Rutter is a prolific English composer of mostly sacred music. Speaking of his life; “As a schoolchild, singing brought me more joy than anything. I was rather shy and awkward but choral singing gave me solace and confidence.” In 2007, Rutter was honoured in the Queen’s New Year Honours List and awarded a CBE for services to music. “See Amid the Winter’s Snow” is an English carol published in 1871, written by Edward Caswell with music by Sir John Goss. We perform Paul Leddington Wright’s recent arrangement. Paul is a member of Coventry Cathedral music staff and conductor of the Saint Michael’s Singers. Our second half contains a mixture of mostly lighter music, not all of which is necessarily associated with Christmas, but is in keeping with the spirit of the season. “Oh Christmas Tree” is a light hearted arrangement by American composer Carl J. Nygard, Jr. of the German Christmas song, ‘O Tannenbaum’. “Freedom is Coming” and “I Gotta Robe” are uplifting spirituals – we have added a seasonal twist to the first! It is said that “Amazing Grace” is one of the most recognised songs in the English-speaking world. Author Gilbert Chase estimates that it is performed around 10 million times annually. Moved by the story surrounding the origins of the hymn and its text, I felt inspired to do my own arrangement. The words in verse four stood out to me in particular and I felt compelled to write a new melody specifically for that verse. “Stars I Shall Find” is a poem by American lyric poet Sara Teasdale (b. 1884 d. 1933) that has been set to music by several composers. Here we perform Victor C. Johnson’s setting. He is an American composer and conductor and currently works as Artistic Director of the Children’s Choir of Texas. “Holly and Mistletoe” – Mark and Helen Johnson are British songwriters who have focused on writing new music for schools, with a vision of ‘putting the singing back into assemblies’. They live in West Sussex and run a successful music publishing business that fulfils this aim. “It’s Almost Like Being in Love”, published in 1947, proved to be so popular that it was released three times by different artists that year. Frank Sinatra’s version charted highest. It was featured in the musical ‘Brigadoon’ that year and again in the 1954 film starring Gene Kelly. “Fly Me to the Moon” was originally released in 1954 as ‘In Other Words’. The song quickly became a Jazz / big band standard. As the song’s popularity increased, it became better known as “Fly Me to the Moon”. Frank Sinatra’s 1964 recording of “Fly Me to the Moon” became closely associated with NASA’s Apollo space program. It is the first music ever heard on the Moon when played on a portable cassette player by Apollo 11 astronaut Buzz Aldrin after he stepped onto the Moon (1969). “Candle Light Carol” focuses on describing the Nativity of Jesus and the love of Mary for her son. Written in 1984, it was first recorded by Rutter’s own singing group, the Cambridge Singers in 1987. It is a particularly popular in the United States, where Rutter’s music is adored. Neil Diamond even recorded a solo version of it for his 1994 Christmas album. “Somewhere in My Memory” was written for the film Home Alone by prolific American film composer John Williams (Star Wars, Harry Potter etc). The melody forms the back bone of the film score throughout. We hope you enjoyed the music.